Dating as far back as history will take us, baldness has been a part of the aging process that many men fear the most. Before Rogaine, hair transplants and hair additions, men coped in various ways from magic ointments to the styling of their hair. Julius Caesar grew his hair long in the back and combed it all forward. Napoleon did the same thing. Somehow we often disregard history and the fact that this has been an age old condition. We can’t imagine or accept the fact that there is not a cure. The progressive loss of hair is known as androgenic alopecia. In men, it is the most prevelant cause of male pattern baldness, and follows a predictable pattern over time. This pattern has been tested across a variety of men and clearly shows the symptoms hair loss. Some years ago, the measurement system known as the Norwood Scale was devised to track this progression. The Norwood Scale progresses through seven levels of hair loss, from Norwood I through Norwood VII, with several variants within each level. By evaluating your own degree of hair loss against the Norwood Scale, you can begin to evaluate the hair loss treatment programs or hair replacement solutions for which you might reasonably be a candidate, and which are most likely to give you the hair restoration results you are looking for. Generally speaking, the earlier you begin treatment, the more likely you are to stop or delay the progression of hair loss to more advanced stages. ANDROGENIC ALOPECIA – the medical term for either male or female pattern hair loss – can be broken down in two parts. First, Androgenic, consisting of ANDROGEN (Any of the various hormones that control the appearance and development of masculine characteristics such as testosterone). And GENETIC–the inheritance of genes from either the mother or the father’s side of the family. Add AGE, which when coupled with genetics, represents a time clock that will signal the hair follicle to produce an enzyme named 5 alpha reductase. When the testosterone present in the follicle combines with the enzyme 5 alpha reductase, it produces dihydrotestosterone (DHT). Hair follicle receptors are sensitive to DHT and thereby start the process of male or female pattern hair loss. Second, ALOPECIA meaning hair loss, of which there are many types. Put simply, scientists are working against aging, hormones and genetics. This is no easy task. Add the fact that male or female pattern hair loss is not life threatening, and it is easy to see why many physicians do not view hair loss as a priority in scientific research. Since there are other causes of hair loss, it is advisable to consult with a dermatologist who is competent and experienced in diagnosing hair loss. Confirming the type of hair loss you have will make it possible for you to know which treatment options may be best for you. Alopecia areata: Generally thought to be an autoimmune disorder. Causes “patchy” hair loss, often in small circular areas in different areas of the scalp. Alopecia totalis: Total hair loss of the scalp, (an advanced form of alopecia areata). Alopecia universalis: Hair loss of the entire body, (also an advanced form of alopecia areata). Traction alopecia: Hair loss caused by physical stress and tension on the hair such as prolonged use of hair weaving, corn rows etc. Done too tightly on weak hair these can cause permanent hair loss. Telogen effiuvium: (usually temporary hair loss) Caused by Physical stress, emotional stress, thyroid abnormalities, medications and hormonal causes normally associated with females. Anagen effiuvium: Generally due to internally administered medications, such as chemotherapy agents, that poison the growing hair follicle. Trichotillomania: The obsessive compulsive condition of pulling your own hair out. Chemotherapy: Cancer treatment which attacks rapidly multiplying human cells. Since hair falls into this category, chemotherapy treatments will naturally cause total and complete hair loss which is generally, but not always, temporary in nature. All of these represent only a few of the different types of hair loss. Androgenic alopecia represents nearly 95% of all hair loss. Learning to live with hair loss. Often the assistance of a professional counselor can be helpful in coping with hair loss. Hair styling and cosmetic techniques such as permanent waves and hair colors. The proper haircut alone can make a vast difference in diffusing hair loss. Rogaine, the only FDA approved topical treatment for male or female pattern hair loss. Although Rogaine is not effective in stimulating new hair growth in many males, it appears to be more effective in retarding hair loss in a substantial amount of both male and females. (Available in the U.S. only through prescription). Hair Replacement Systems have made many advances in both appearance and more secure attachment methods. Hair Replacement Surgery has also made many advances towards more natural appearing results. 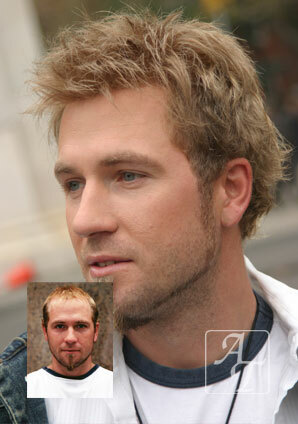 A combination of Hair Replacement Systems with Hair Replacement Surgery. Affordable hair replacement services custom designed to your individual baldness and hair loss solution requirements. The security of dealing with a firm that’s been in business in the same location for over 20 years. With hair restoration, there are many options to consider but only one phone call you need to make. Take the first step to a new you. Schedule your free, private and confidential hair loss evaluation today.